All customers want to have positive feelings towards their service provider, but nowhere is that more clear than in dentistry. With over 15% of the population having an immense fear of dentists, it helps to perceive them as friendly faces. And since we’re all using social media nowadays (primarily to get in touch with our friends and family), what better way to show that you’re a both a friendly and professional dentist? Dental practices who use social media marketing can significantly improve their credibility. They have unique opportunities to create a better relationship with both existing and potential customers. In this guide, we’ll teach you everything about using social media marketing for dental practices. It’s time to put healthy and satisfied smiles on the faces of your patients! If we think about all the times’ patients canceled their appointments with no explanation, we’ll know it’s very likely that they – to put it colloquially – chickened out. This is not surprising, but it’s an annoying phenomenon that most dental practices face. Social media can help combat fear by helping your dental practice establish its credibility. We obviously don’t want to market our practices by way of mentioning root canals front and center. So what can we focus on instead? The most important thing is first-hand customer testimonials. Consumers trust other consumers more than businesses, and this fact is heightened in dentistry. And while we can have a lot of reviews on our sites, social media marketing gives us social proof. Potential customers can see actual reviews from actual people who won’t just touch on the dentist’s professionalism, but their approach as well. And when customers call to book their first appointment with a positive feeling they got through social media, it’ll transfer to when they actually visit the practice. Social media marketing is incredibly efficient at showing dental practices in all the right lights. Social proof was given with the reviews that customers left on their own. However, practices can show their expertise and care, as well. By engaging customers and answering their questions on social media, dental practices can show that they’re professional and friendly. When pleasant and positive visuals are added to the mix (such as images of the practice and the staff), it’s a winning combination. And since social media rewards engagement, there’s no reason not to start chatting to (potential) customers, liking their Instagram posts or amplifying their positive experiences on the business page. There’s no need to be afraid of humor. 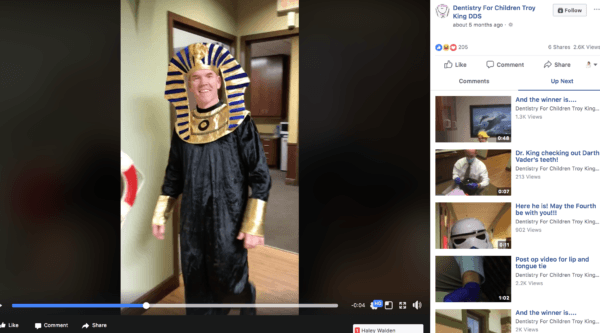 For example, Dentistry for Children Troy King isn’t afraid of showing their unique personality with behind-the-scenes Facebook posts. Not to mention that this boosts employee morale, as well. 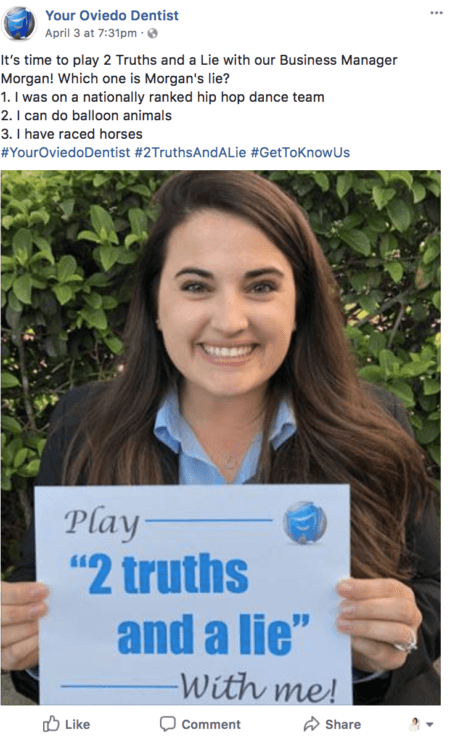 A lot of trust goes into choosing a dental practice, and since consumers trust other consumers, dental practices can leverage employee advocacy to get even better results. In fact, consumers respond so positively to brand ambassadors that one message shared by an employee ambassador goes 561% further. The staff at your dental practice doesn’t necessarily have to re-share your business page’s updates. They can also create their own content to amplify the voice of your practice on social media and reach more people. This starts with the culture, of course, but if you’ve got a friendly working environment where everyone’s creative and comfortable expressing their ideas, it’s good to go hands-free and let your employees create the content about dentistry that their friends will be interested in reading. You can also motivate your staff to take action by gamifying the process and rewarding the most active participants. Don’t forget about highlighting your employee ambassadors’ personalities, as well. This post is a great example of one very important part of employee ambassadorship. If your staff is amplifying your dental practice’s voice, make sure you amplify theirs. Not only will your staff be more satisfied with their jobs, but your customers will enjoy interacting with people who already feel like friends. It can take a while to set up a brand advocacy program on your own. That’s why we’ve created an easy way to turn your dentists and staff into employee ambassadors who’ll bring in happy new customers with DrumUp. When consumers see active and engaging dentists taking part in your social media marketing strategy, they’ll see that there’s nothing to be afraid of. After all, they’re in the hands of such friendly and credible dental practice. Unlike a lot of other businesses which can go fully digital, dental practices are location-based. However, that’s a big positive in the social media marketing landscape. The first thing you should do is add the address of your dental practice to your social media. And to improve upon the rankings, you can even ask your patients and staff to check in at your location (with a brief comment). Whenever someone checks in at a location, it’ll be shared as a post for all of their friends to see. And if someone’s on the lookout for a great dentists, it’s your practice they’ll find on their news feed. Additionally, if you’ve got a Google My Business listing, the reviews from social media will be automatically synchronized, amplifying your practice’s presence even more. When posting on Instagram, don’t forget local hashtags and stickers. Let’s say your practice was in Brooklyn. If you used the location sticker for your Story, someone in the vicinity could find your dental practice just by clicking on the ‘Brooklyn’ featured Stories. Social media ads are another great way to improve your social media marketing. With improved ad objectives, you can even get more accurate targeting. Especially if you’ve installed the Facebook Pixel in your website. It automatically monitors who booked an appointment and uses that data to find more people similar to them. Even if someone wanted to book but decided not to in the last minute, you can retarget them with Facebook ads to remind them that your practice is still here – and it’s still credible and amazing. Pro tip: Use employee ambassadors for your ad campaigns to amplify your dental practice’s credibility. Community engagement and employee advocacy are a great way of providing social proof in the ads you launch for your dental practice. Not only are you getting better social media marketing results, but you’re also showing that your staff is at the forefront of your success. The goal of having a social media marketing strategy for a dental practice is building credibility and relationships. A significant part of these goals can be achieved with the right kind of content. And with social media, not even the sky is the limit. Don’t forget about video. You can show patient testimonials, interviews with the team, demonstrate methods and techniques, or upload Q&A sessions (which can also be done through live video features on platforms like Facebook and Instagram). If you have a blog, you can always repurpose content for social media and share it with your patients in bite-sized quantities. Going to the dentist is a routine thing, but a lot of people are still afraid. So by showing the people behind your practice and your unique approach on social media, you’ll be able to nip that fear in the bud. And if you have great staff to support and amplify your presence, patients will recognize it. And before you know it, your phone will be ringing with happy customers referring their friends.